It was a battle among a trio of treats for Valentine’s Day — Conversation Heart Dipped Oreo® Cookies, Chocolate Covered Strawberries in Velvet Heart Box 9 Count and Junior’s® Heart-Shaped Cheesecake. Here is what some of you said — “Love Junior’s Heart-Shaped Cheesecake! Makes My Heart Skip A Beat”, “The Strawberries Are The Real Deal”, “That Cheesecake Though…” and “Love Candy Hearts”. In the end it was the Junior’s® Heart-Shaped Cheesecake that melted most hearts! Thank you, fans for participating in Which Treat Makes Your Heart Skip a Beat. We hope you had as much fun naming your favorite treat as we did reading about them. Here are the Valentine’s Sweepstakes Winners: S.B. winner of the Conversation Heart Dipped Oreo® Cookies. D.L. winner of the Chocolate Covered Strawberries in Velvet Heart Box 9 Count. S. K. winner of the Junior’s® Heart-Shaped Cheesecake. Congrats to our Valentine’s Day Sweepstakes Winners! Check our Design Room blog this spring. We’ll be seeing green with fun give-aways and chances to win prizes on social media. Happy Valentine’s Day from all of us at 1800Baskets.com! Send your valentine a sweet treat or beautiful basket from the 1800Baskets.com Valentine’s Collection. Our baskets are brimming with the finest gourmet delicacies, creamy chocolates, heart shaped cookies and more! Love and care. We put them in each delightful basket. Countdown to Valentine’s Day! Send your sweetheart a romantic basket brimming with treats or super cute gifts from 1800Baskets.com. Your valentine will swoon over heavenly chocolates, plump fruit baskets, Valentine theme gifts….and that’s just the beginning. Whether your sweetheart is a connoisseur of chocolates or crazy for salty snacks you are sure to find the perfect gift basket in our Valentine’s Collection. Don’t forget to order some chocolate treats to have on hand for Valentine’s Day guests. Have you tried Cupid’s Choice Chocolate Dipped Strawberries? Our strawberries are dipped in delicious 100% Real Dark Chocolate then drizzled or decorated to perfection. Real Love Deserves Real Chocolate™! Love to decorate with hearts for Valentine’s Day? Create a sweet country heart shaped wreath to dress up your front door for the holiday. Here are the easy directions: create a burlap heart wreath with bow. You may even have time to transform your dining table with these cute mini heart topiaries from our friends at Celebrations.com. Enjoy all your Valentines Day planning, shopping and decorating. Happy Valentines Day from 1800Baskets.com! Which Treat Makes Your Heart Skip A Beat? Coming Soon! Will it be Conversation Heart Dipped Oreos® Cookies, Chocolate Strawberries, or Junior’s® Heart-Shaped Cheesecake? Celebrate Valentines Day with 1800Baskets.com and a Sweet Treat Sweepstakes! We’re gearing up for a face-off competition among our trio of decadent treats. Join us on February 13 as we kick off our Valentines Sweepstakes, Which Treat Makes Your Heart Skip A Beat? Sign up for the Sweepstakes and you could win one of Cupid’s treats! Three winners will be randomly selected from the pool of sign ups. Stay posted for the Sweepstakes and sweeten someone’s Valentines Day with our Valentines collection. We have baskets of creamy chocolates, indulgent sweets & savories and fine wine gifts to make them swoon! Your sweetheart will adore this Valentines Day Gift Basket which evokes a taste of the European countryside. This artisan woven basket is abundant with Italian Amaretti Cookies, Butter Toffee Caramels, Fudge Toffee, Royal Chocolate Dark Belgian Chocolate Thins, Toberlone® Swiss Dark Chocolate and more! Many nice surprises for Valentines Day in a keepsake basket with red bow! For Centuries Valentines Day has been celebrated with gifts, cards, love notes and songs. Who penned the first valentine? It may have been the Duke of Orleans about 600 years ago! Would you love to win the Strawberry Twitter Party Heart Box? Valentines Day Strawberry Twitter Party! Scavenger Hunt & Scrumptious, Berry Delicious Prizes! Monday Feb 8, 2016 at 2:00 PM EST. Register before the entry period on Feb 8, 2016. Are you ready? How many Seeds in a Strawberry? Approx 200! Please Note: During the Valentines Day Strawberry Twitter Party you must use #Berrysweet and #Sweepstakes when you answer the questions. One winner for each Sweepstakes question will be randomly selected from the pool of contestants. February 8 update! The results are in! ENTRY PERIOD: 1-800-BASKETS.COM® #Berrysweet Valentines 2016 Twitter Party with giveaways (hereinafter the “Sweepstakes”) begins at 2:00 PM EST on Monday 2/8/16 and ends approximately at 3:00 PM EST on Monday 2/8/15 (the “Entry Period”). HOW TO ENTER/PARTICIPATE: You must be 18 or older and have or open an account on Twitter.com to participate in the Sweepstakes. Accounts are free and can be opened by visiting Twitter.com. You must follow 1-800-BASKETS.COM® on Twitter (@1800Baskets) during the Sweepstakes Entry Period. You must use the hashtags #Berrysweet and #Sweepstakes in tweets when responding to the posted questions from @1800Baskets on Twitter during the Entry Period. ADDITIONAL ENTRY TERMS & CONDITIONS. Use of computer programs and/or other automated devices to enter the Sweepstakes are prohibited. Normal Internet access and usage charges imposed by your on-line service will apply. By entering and using the promoted hashtags (#Berrysweet & #Sweepstakes) you understand that a) the Sponsor has the exclusive right to use your entry and excerpts of your entry in any advertising and promotional materials (visual, sound, print and/or electronic form), including posting entries or portions thereof on its website, social media accounts/pages, advertising. etc. ; b) you grant any and all necessary rights and licenses provided herein, including without limitation, all necessary copyright and other related rights to the entry, free and clear of all claims and encumbrances without violating the rights of any person or entity, including any right to privacy or publicity; and c) you hereby hold the Sponsor harmless from and against any third party claim arising from use of the entry and waive any right to inspect or approve uses of the entry or to be compensated for any such uses. All entries become the exclusive property of Sponsor, and may not be acknowledged or returned. Proof of submission will not be deemed to be proof of receipt by Sponsor. Total ARV of all prizes is $139.97 USD. WINNER SELECTION: During the Entry Period The Sponsor will ask a number of questions, some for fun and some for prizes. Three (3) of the questions will be for the prizes listed in Section 3 herein (the “Prize Questions”). Three (3) Prize Questions will be posted by the Sponsor and three (3) winners selected. The format will be as follows: A Prize Question will be posted by Sponsor along with a URL link where the answer can be found and a time frame in which to respond to that specific question with the correct answer. All correct responses that are eligible entries to that specific Prize Question that are received within the stated time frame will be pooled together and a random winner selected. This process will be repeated until all 3 Prize Questions are asked and entries collected. Drawings will be conducted by a representative of Sponsor, whose decisions are final on all matters relating to this Sweepstakes. Odds of winning are dependent upon the number of correct eligible entries received for each Prize Question. Non-winning entries will not be rolled over into the next question drawing. Prizes will be awarded and potential winners will be notified by mention and/or direct message on Twitter. Prizes are nontransferable and no cash substitution is allowed except by the Sponsor, who reserves the right to award prizes of equal or greater value if advertised prizes are unavailable. WINNERS LIST: For the names of the winners visit www.1800Baskets.com from approximately 2/11/16 through 3/11/16. Looking for Valentines Gift ideas and treats to give all your valentines? Conversation Hearts Valentine Sweets Tower and Cheryl’s Valentine Mailbox with Treats are featured in Valentine’s Day Gifts For The Lovers #TwoBlogsFunGuides! Welcome to the 2016 #TwoBlogsFunGuides Valentine’s Day Gifts For The Lovers Guide. This guide is full of fun and exciting gift ideas for couples or romantic partners. All of these gift ideas will be sweet, cute, romantic, and thoughtful. Each of these gifts are personally recommended by Women and Their Pretties and/or Mama Smith’s. Be sure to check daily because we are constantly adding the new items that we discover! Valentine’s Day 2015 is on a Saturday – make it a romantic celebration-in with these at-home spa tips! If you’re looking to make this a weekend celebration, check out our ideas on how to celebrate a Valentine’s Day weekend! Pick up a spa basket filled with all of the essentials – keep in mind when choosing the perfect spa assortment to try and choose a scent you will both enjoy. Here are several tips for a spa day at home – while this is a great activity for a romantic night, in a spa day can also work for ladies night! Start by selecting the spa scent. When choosing your spa assortment, try to choose a scent that the both of you will enjoy. If you’re unsure, a safe option is always a “clean, fresh” scent such as with the Apres Rain Spa Basket. Create a spill-proof zone. Neither one of you is going to want to jump and grab the paper towels when you’re mid-relaxation with a face scrub on. Rather, take some time beforehand to cover floors and surfaces in old newspapers or similar so any accidental drips or spills can be addressed after the relaxation time is over. Keep the menu light. Starting with breakfast and throughout the entire day, choose meals that won’t leave you feeling heavy or bloated. Skip the 3pm coffee. If coffee or tea are part of your daily routine, be sure to indulge in the morning, pre-spa activities. The reason for this is any muscles that caffeine can actually cause muscles that have relaxed during the spa-tacular itinerary to tense up. Prepare a playlist. For a romantic spa day, pick your favorite love-inspired songs. If you the two of you have a special song, be sure to throw it in the mix. Prepare warm towels. If possible, do a laundry load of towels and dry them morning of. Store them in an sealed bag to keep the warmth in. That way, you have warm towels to use during your spa day! Prepare conversation cards. As much as you may know about the other person, there is always more to learn! Prepare conversation cards with random questions such as, “what’s your favorite 80s song” or “what’s your dream vacation” or similar questions that you may not know the answers to. Alternatively, you can prepare topics to discuss for a deeper conversation. These will come in handy during downtime such as waiting for a face mask to harden! Cool down with refreshing sips and snacks. You’re guaranteed to be spending a lot of time in hot steam during this day, so be sure to stay hydrated and refreshed with cool drinks or snacks (like mini wine popsicles – yum!). Experiment with essential oils. As mentioned above, spa and steam go hand in hand. Take advantage of this by adding a dash of essential oils to the mix! Choose essential oils known for their benefits, such as sage, eucalyptus, or clarysage. Valentine’s Day falls on a Friday this year. Rather than making reservations at your go-to spot, whisk your special someone to a romantic getaway – all from the comfort of your own home! We’ve put together some of our favorite romantic gift baskets, so you can have the staycation of your dreams without all the prep work. After a long day of work, there’s nothing quite as satisfying as kicking off your shoes and cozying up to your special someone. Surprise your sweetie with a romantic dinner for two, complete with their favorite bottle of wine and savory cheese pairings. After a light dinner, treat your sweetie to a spa treatment at home. Set the mood with elegant candles, while treating your Valentine to a well-deserved massage with one of our romance-ready spa baskets. Did you know that February is also Creative Romance Month?! With the weekend ahead of you, here’s the time to put a fun spin on your time spent together. Skip the Netflix marathon and plan a romantic celebration you can still do within the comfort of your home! It may be a bit too chilly to do the traditional picnic in the park, so why not turn your living or dining room into the picnic area of your dreams?! Dazzle your date by filling the room with fresh flowers and a prepared picnic basket for two. Light a candle or two – you’re not outdoors so there’s no risk of forest fires! Create your very own romantic scene with some dim lighting and bubbly for a one-of-a-kind date night at home. Don’t go out, rather order in and leave the rest of the world at the door as you focus on falling in love with your sweetie all over again. Before finishing up with dessert, take your sweetie out on your own personal dance floor and dance as fast or slow as you’d like. Prepare you playlist beforehand with some of her favorites as well as a few of the classics. Finish your meal off by indulging in decadent chocolate strawberries paired with a champagne toast to the two of you. Wake your Valentine up to the smell of buttery pancakes and maple syrup with a savory breakfast (or brunch) for two. Spend today lounging around and day dreaming with your significant other. Get to know each other all over again. Ask how work is going and really take the time to listen. Make today not just about romance, but also about friendship. After all, she is your best friend! A lot of great deal breakers from your comments! I consider myself an expert Television watcher and at least 10 of the deal breakers you all commented on have happened on various episodes of Full House and Saved By the Bell; I feel like we all should have had these important life lessons ingrained into our brains by now (maybe it didn’t work because the moment wasn’t accompanied by some situational theme music or a long speech breaking the third wall from Zack Morris or Danny Tanner). Point being, aside from telling you all the television shows I know better than my own memories, is that I never knew these deal breakers happened outside of my television screen! Anyway, winners! Congratulations to Danielle Levins (February 2, 2012 at 4:19 pm), Janey B. (February 3, 2012 at 7:26 pm), Lucy (February 7, 2012 at 6:49 am), RAJ (February 9, 2012 at 12:35 pm), Adrian (February 9, 2012 at 3:21 pm)! Email your shipping information to amariscal@1800flowers.com and I’ll send out your Valentine’s Day treat tower! Valentine’s Day is less than a week away! Are you all prepared? Do you have Valentine’s Day plans or non-plans? Maybe Valentine’s Day gift ideas? I will be doing everything very last minute, so I foresee a more “homemade” Valentine’s Day gift in my near-future project list. If you’re feeling rushed on time for Valentine’s Day planning, don’t fret! I have a few fun and interesting ideas for unique and loveable Valentine’s Day gifts. If you’re looking for a unique spin to the traditional Valentine’s Day gift, 1800baskets.com has you covered! As we all know by now, I’m not a big fan of pink, but even I think this Valentine’s Day gift is very adorable and could be great decoration for after the holiday. 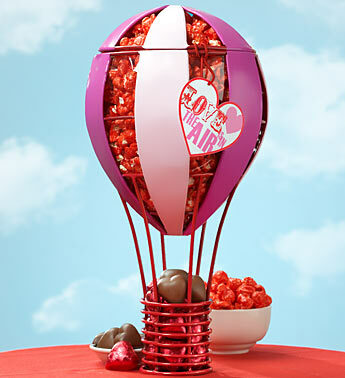 Our “Love is in the Air Balloon & Sweets” gift basket would make for a great surprise for any sweetheart this Valentine’s Day. Containing Cinnamon popcorn from The Popcorn Factory and foiled-wrapped heart chocolates, it’s the perfect spin on a traditional Valentine’s Day gift (also the contents taste amazing!). If you want to get more creative, we have some select gift baskets perfect for a romantic Valentine’s Day celebration. Try out our “Irresistible Valentine’s Day Wine Gift Basket” or “Romantic Evening Red Wine & Lindt® Truffles”, both equipped with delicious wine and fine chocolates. Have this gift ready to present with the promise of an intimate night in together. A great way to show you planned something romantic for this Valentine’s Day. I recently went to a friend’s wedding and they had a really great and romantic idea that could be used for those of you who are looking for a more home-made idea. They had a series of empty and decorated wine bottles with different year increments on them (like 1 year, 5 years, 10 years, etc) and had all of their guests write small notes to them for each anniversary. So when they reach that anniversary date, they will read all the sweet notes everyone sent to them on their wedding. I think an idea of this that would be cute to try out is to get a few empty bottles, decorate them with certain dates or events and have some little love notes inside for your significant other to read later! Another great home-made gift is to make a coupon book (this is a good stand-by for any celebration!). One of my friends went to a family Christmas party where one of the members decided that instead of everyone buying them gifts, they would rather have everyone pick a piece of paper hanging on a string from her ceiling fan, on each piece of paper was a chore or task to do. Personally, I think that’s brilliant and I’m a little shocked I didn’t come up with it first. Obviously, you can change around the book to more romantic, Valentine’s Day related things or coupons that relate directly to you. What are some unique Valentine’s Day gift ideas that you have? Let me know in the comments section (1-2 paragraphs) and FIVE will win the Love is in the Air Balloon & Sweets Valentine’s Day gift basket!